Jiangsu Huimin Traffic Facility Co., Ltd. Welcome to visit the website of Jiangsu Huimin Automobile Accessories Manufacturing Co., Ltd.
PSD controlling system is a new high-tech automatic controlling equipment, mainly consists of five systems as automatic controlling system, PSD system, power supply system, central monitoring software system. There are three controlling means of PSD: system control(on vehicle for driver operation), station control(in service room) and manul control(in service room, for emergency use). Herein manual control has the highest priority. 1)	System control: a basic control system, which is to control the electrical double sliding doors with wireless remote control device. PSD normally responds within 0.3s upon commanding of system control; when the driver opens the vehicle door, PSD will opens itself simultaneously; when the driver closes the vehicle door, PSD will closes itself simultaneously. PSD runs 20 hours a day, opening and closing itself one time every 120s, for 365 days continuously per year. This control system is designed as a multithreading remote control, that is all the vehicles and PSDs within a line are remote-controlled by the same frequency. To invoid misact of nearby vehicle within the line, control distance is set as 7 meters. blanks in failure indicating area will show the failed location, unit number and failure cause: 1. Moter broken; 2. Bad connection of master line; 3. Blocking in guide rail; 4. System self-checking unfinished. Therefore, failure information is known directly, and the failed PSD unit can be isolated quickly and operated by station control. 2)	Station control: when any abnormity happens, e.g. system control cannot work properly or one PSD fails to respond to system control commands, the operators can open and close the doors by manual control button on the control panel in service room or by manually operating the remote control device. 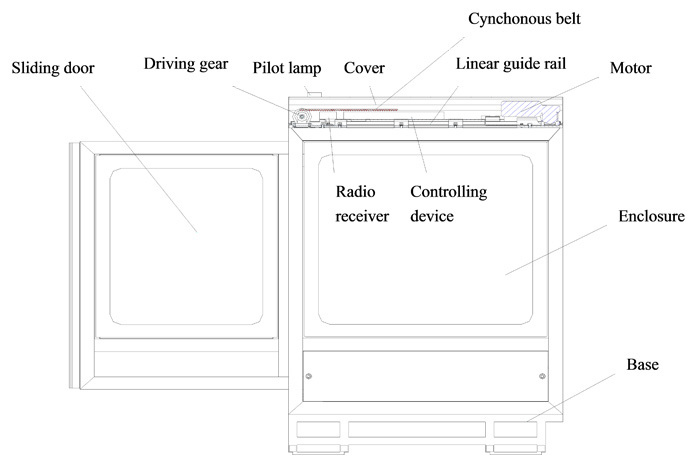 Station control is designed as a shunt-wound controlling, which is a backup of control system. According to the failure indication on control panel in service roon, the operator can manipulate the PSD easily and accurately by this control backup. Even if any unexpected power supply failure, station control is ensured by automatic switching to UPS in service room. When the bus stops at the platform, two doors of it usually correspond to two PSDs. When the driver presses the open side of the switch, bus door and PSD open simultaneously; When the driver presses the close side of the switch, bus door and PSD close simultaneously. If PSD meets any obstruction during closing, it will open automatically until the operator re-close it by pressing the switch on control panel in service room. Platform Screen Door Driving System uses brushless DC moter(24V, 100W) as its drive force, which is output by worm and gear. Synchronous belt then change the rotative movement of moter into linear reciprocating movement of door to open and close the sliding door. 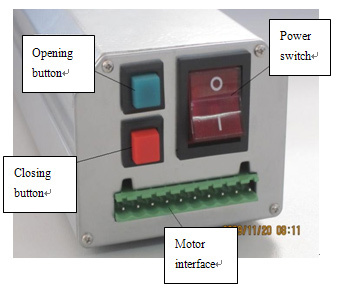 Self-locking of sliding door is managed by engagement/disengagement of power supply. When the sliding door meet with any obstruction during closing, controller will receive a signal and send out a command to open the door to prevent any injury or damage. PSDs can be open/closed directly by pressing buttons on central controller in service room. 2 PSD cannot open 1.Vehicle fails to park in the right place, cannot receive the signal; 2.Something wrong with the vehicle signal transmitting device; 3.Something wrong with the PSD signal receiving device. 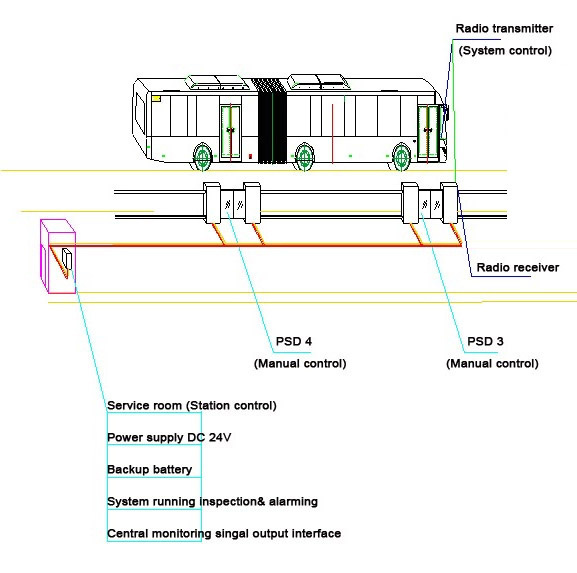 1.Train the driver; 2.Change the vehicle signal transmitting device; 3.Change the PSD signal receiving device. 3 A door in a team of linked PSD fails to work 1.Controller is broken; 2.Fuse breaks; 3.Motor is damaged. 1.Change the controller; 2.Change the fuse; 3.Change the motor. Open the access panel with the key. Press the closing door button to check whether the motor is working properly or not. If the motor fails to work, something is wrong with electrical part; if the motor works properly, something is wrong with the mechanical part. Electrical part failure: check the controller first. If the controller works properly, the motor is damaged; if the controller fails to work, the relay needs to be replaced. If the mentioned two parts are good, the failure may exists in circuit. Electrician should check and modify the circuit. Mechanical part failure: check the driving parts by visual survey. Repair the part if it is damaged or stuck. If nothing is wrong with mechanical parts, take down the motor and check its worm gear and worm screw change them if damaged. Opening and closing position of door is adjusted through stop screw on sliding doors. Change the position of stop screw to control the motor running, thus opening/closing position of door is decided. After adjustment the stop screw must be fixed with jam nut. Running condition of PSD should be monthly checked, such as status of synchronous belt, tight expansion device, motor fixing bracket, fastening screws and lubrication of guide rail. To lubricate the guide rail, pour lithium grease into guide rail to reduce abrasion and increase its service life.